What is a Panel PC? A Panel PC is an integrated solution combining both a display and a computing unit, making for an all-in-one computer. 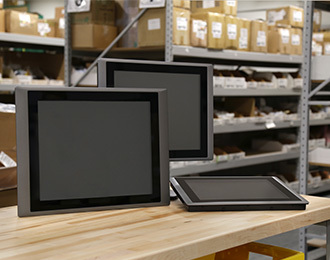 Industrial panel PCs are typically more ruggedized and offer both capacitive and resistive touchscreens. Capacitive touchscreens enable multitouch functionality, while resistive screens can be used by operators wearing gloves, a feature commonly needed in manufacturing and production environments. We’ve seen different approaches to the Panel PC design, but one of our favorites is offered by Cincoze. The innovative Crystal Series of panels from Cincoze allows the display and industrial PC to be detached, which can help to lower costs and reduce downtime for installations that might require maintenance on only the display or PC. Why choose a Panel PC? One major advantage of Panel PCs is that they provide an integrated solution that does not require compatibility testing between the display and the computer. Another obvious benefit is installation flexibility. Panel PCs can be mounted right where they’re needed without the need to run wiring to a separate PC. Panel PCs are frequently used for human machine interface (HMI) as the touch capabilities make controlling equipment easy and efficient.